Hidden in a secluded location and nestled on top of an extinct volcano crater, Pikaia Lodge is a stunning new alternative for exploring the “last paradise on Earth” in a truly sustainable, yet luxurious land based way. The Pikaia Lodge concept is designed for the environmentally conscious, eco-adventure traveler, who seeks intimate contact with the unique natural heritage of the Galapagos along with all the comforts of a highly evolved lifestyle. 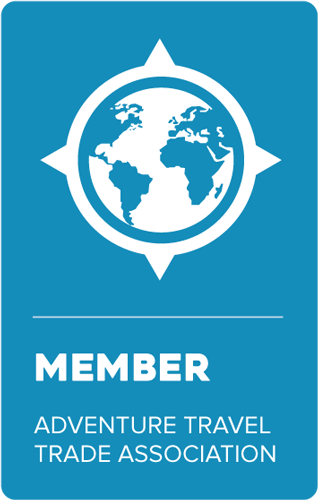 No lack of privacy, rigid timetables, seasickness nor confined spaces of the typical yachts or cruises. As our Pikaia Lodge guest, you will enjoy active, quality guided land and marine day programs in small groups. At night you’ll rest in spacious and quiet accommodations. Due to its central location in the Archipelago, the Santa Cruz Island provided us with the perfect opportunity to develop our unique land based day tour concept, since the most interesting islands, secluded white sandy beaches and wildlife sites of the Galapagos National Park are nearby. All these can be reached within relatively short navigation times on board our large, comfortable, safe and stable oceangoing yacht Pikaia I. In fact, you will discover some of the finest beaches of the Galapagos near the lodge. Just by taking a stroll, you can come face to face with a wild giant tortoise. Pikaia Lodge has its own private Tortoise Reserve on the property. These six beautiful rooms on the ground floor are nestled on top of the small plateau of our main crater and are conveniently close to the main building. 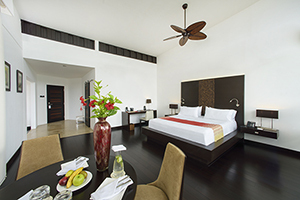 All of them have panoramic floor to ceiling windows with access to private shaded terraces with breathtaking unobstructed views to the Galapagos National Park savanna and volcanic cones, to other islands and the Pacific Ocean. They are 43 m2 in size including terrace, with a modern and cozy contemporary style decor and are naturally well lighted. They are furnished with either two queen size beds or one king size bed with cotton linens, duvet covers and plush hypoallergenic pillows, a desk with chair and two comfortable armchairs. These six beautiful rooms in the first floor are nestled on top of the small plateau of our main crater and are conveniently close to the main building. All of them have panoramic floor to ceiling windows with access to private shaded terraces with breathtaking unobstructed views to the Galapagos National Park savanna and volcanic cones, to other islands and the Pacific Ocean. They are 43 m2 in size including terrace, with a modern and cozy contemporary style decor and are naturally well lighted. They are furnished with either two queen size beds or one king size bed with cotton linens, duvet covers and plush hypoallergenic pillows, a desk with chair and two comfortable armchairs. This beautiful and spacious suite is nestled on top of the small plateau of our main crater and is conveniently close to the main building. 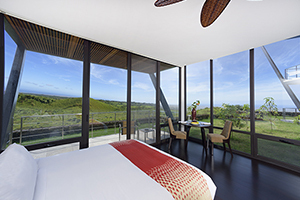 This suite has panoramic floor to ceiling windows with access to a private shaded terrace with breathtaking unobstructed views to the Galapagos National Park savanna and volcanic cones, to other islands and the Pacific Ocean. Windows have black out curtains for late sleepers. It is 51 m2 in size including terrace, with a modern and cozy contemporary style decor and is naturally well lighted. It is furnished with a king size bed with cotton linens, duvet covers and plush hypoallergenic pillows, a desk with chair and a sofa-bed with two comfortable lounge chairs. This beautiful and spacious suite is nestled on top of the small plateau of our main crater and is conveniently close to the main building. 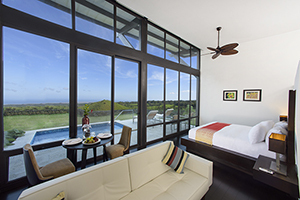 This suite has panoramic floor to ceiling windows with access to a private plunge pool and a shaded terrace with breathtaking unobstructed views to the Galapagos National Park savanna and volcanic cones, to other islands and the Pacific Ocean. It is 51 m2 in size including terrace, with a modern and cozy contemporary style decor and is naturally well lighted. 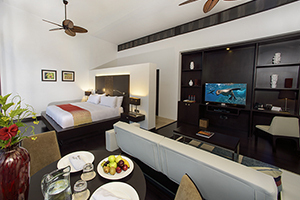 It is furnished with a king size bed with cotton linens, duvet covers and plush hypoallergenic pillows, a desk with chair and a sofa-bed with two comfortable lounge chairs. 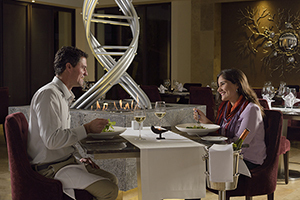 The “Evolution” Restaurant is situated in our main building on top of the edge of the crater. 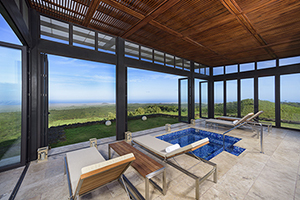 It offers an unrivalled view from the pristine Galapagos National Park with its mist covered volcanic cones, to other islands in the Archipelago and our infinity edge pool. It is furnished in a contemporary style decorated with casual elegance, with a subtle artistic touch inspired by the evolution of mankind. Romantic candle lit dinners and barbeques “alfresco” under the stars will also be served around our softly illuminated infinity edge pool. Evolution Restaurant serves breakfast, lunch and dinner. After a “hard” day of explorations you can chill out in splendid comfort at our Happy Hour, framed by a stupendous view of the Galapagos natural settings bathed in the hues of a rapidly setting equatorial sun. Share your discoveries, digital pictures and videos with family, friends and fellow travelers, or just hang out in the serene, cozy atmosphere. 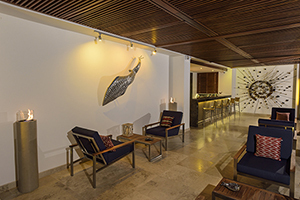 To ensure prompt service, Piakaia’s DNA Bar is strategically placed between the restaurant, the lobby-lounge, and the shaded terraces and pool area. Our barmen can mix world famous cocktails as well as popular local drinks prepared with top quality imported liquors, freshly squeezed tropical juices, Champagnes, exotic spirits, wines, beers, soft drinks and bottled mineral water. Our wellness center is an oasis of calm, perched on the rims of the craters at the eastern end of the main building with dramatic views of the Pacific Ocean interrupted only by a few islands in its vastness. “Sumaq” is decorated with Peruvian travertine marble in a minimalistic Japanese Zen style to soothe the mind. It is a serene place to spend well deserved time releasing muscular tension and stress while travelling, or to pamper and purify the body with a massage after a “hard day’s” explorations. There is a massage room for parallel massage sessions for couples. Massage sessions can also be done in the guest rooms if requested. Our wellness center is also equipped with a state of state of art infrared sauna for a more comfortable sauna experience. The whirlpool provides the best ambience to experience utter peace and profound relaxation with its never-ending, 180- degree view of the ocean.